There are 3 major tour bus companies in the city. Each has a different feel, but they will all show you basically the same things. Think about an evening tour of the city. It is less crowded and the marble memorials are beautiful when they are lit at night. Think British double decker bus – if the weather is nice the kids will love to ride up top! This is a hop on hop off bus tour meaning that multiple buses stop at the same sites throughout the day and you may ride any of the buses. The bus is air conditioned on the lower level. Tickets may be purchased in advance though their website or you may purchase them from any tour bus driver. The tour buses run from 9:00 a.m. – 5:00 p.m. 7 days a week, even on holidays. The buses stop at each site every 30 minutes. Tickets are $30 for adults and $15 for children 4-12. The tickets may be used for two consecutive days. Click here for a complete list of sites you will visit. The Open Top twilight tour runs seasonally, usually beginning in March. Check their website for an exact date. Tours run 7 days a week and tickets are $39 for adults and $20 for children 4-12 years old. The tour begins at 7:00 p.m. and last for three hours. Tickets can be purchased online on their website. Strollers are allowed, but must be collapsible. They will be stored in a specific section of the bus. 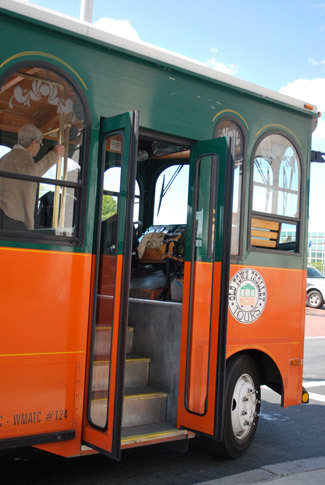 The Old Town Trolley is another hop on hop off tour of the city. The bus is an open air trolley and although some of their newer models are air-conditioned, most are not. Tickets may be purchased online or at ticket kiosks located at the Washington Welcome Center, at the corner of 10th St. and E. St., NW, or at Union Station, where the booth is located in the front of the Main Hall. The tour buses run from 9:30 a.m. to 4:00 p.m. 7 days a week with buses making stops at each site every 30 minutes. The buses do not run on Christmas Day, Thanksgiving, the Fourth of July, the day of Rolling Thunder (a big motorcycle gathering usually the Sunday before Memorial Day and the day of the Marine Corps Marathon (sometime in late October). Tickets are $35 for adults and $18 for children 4-12 years old. The tickets may be used for two consecutive days. The Old Town Trolley twilight tour leaves from Union Station at 7:30 p.m. year round and it is a two hour tour. Tickets can be purchased at Union Station, but it is advised to purchase them in advance by calling 202-832-9800. Strollers are allowed, but must be collapsable. They will be stored in a specific section of the trolley. 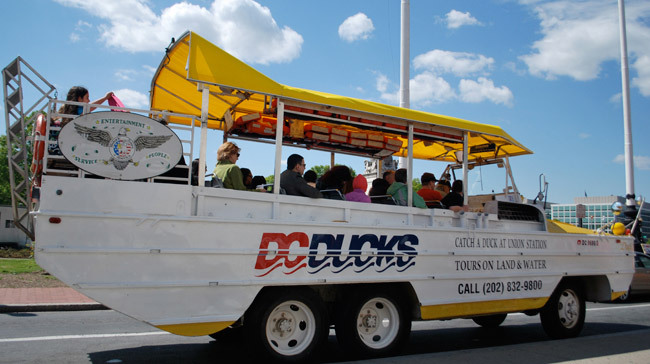 The DC Ducks is the perfect tour of the city for kids – complete with complimentary duck whistles/quackers. This is a 90 minute non-stop tour that takes you over land and water. The tour is conducted in a WWII DUKW amphibious vehicle which means after you take a drive past the major sites in the city you’ll splash down into the Potomac River for a unique view of the city from the water. The tour guides are known for having a great sense of humor and quacking is encouraged! Tickets may be purchased online but you are not able to reserve a specific tour time. Tours fill up on a first come first serve basis so it is advised to take the tour early as the afternoon tours are the most popular. Tours depart from Union Station and tickets may be purchased at the ticket counter on the day you wish to tour. Tours run from mid-March through October on the hour every hour from 10:00 am to 4:00 pm 7 days a week. Tour buses do not run on Memorial Day, the 4th of July or the day of the Marine Corp Marathon. Tickets are $35 for adults and $33 for all children under 11 years old. Click here for a general list of sites. Strollers may be stored at the DC Ducks ticket counter, but are not allowed on the vehicle. If any of you have been to D.C. before and ridden the Tourmobile, these buses may look familiar. Martz bus company bought the old tourmobiles when the original owners went out of business. The Martz Mall Express is not a jump on jump off tour. The bus stops at Union Station, the World War II Memorial, the Lincoln Memorial, Arlington National Cemetery, Martin Luther King Memorial, Smithsonian Metro Stop and back to Union Station. You may choose a roundtrip ticket for $9.00 which allows you to depart the bus once during the trip and board another later bus. Any additional departures you make will be an additional $5. Tickets may be purchased at Union Station, at any of the above mentioned stops from the bus driver or online.